IS ISIS ON THE SLOPE ? – THE LIBYAN CASE . The raise or the fall of the Islamic State, the Caliphate, can be measured by different indexes. The size of territories controlled by ISIS directly or indirectly, by the number of followers joining the organisation and their devotion, by the circulation of its core ideology, by the number of affiliated or supportive organisations and/or groups, by its political support from regional and international powers, by the political alternative, by its economic means and by its locations. There is another meaning if ISIS is well placed in the remote sub-Saharan, in the mountains of Afghanistan or along the oil fields of the Mediterranean coast just few hundreds k”m from the Southern shores of Europe. The Islamic State (IS) has lost 40% of the territory it once controlled in Iraq, a spokesman for the US-led coalition battling the jihadist group Col Steve Warren told reporters on Tuesday 01/05/2016. Assuming the assessment is real and not a wishful thinking it has only minor influence on the ISIS phenomena. Actually there are more indications that ISIS is on the rise. A. The growing rift between Sunnis and Shiites in the Middle East and the tension between Saudi Arabia, Turkey and the Gulf Emirates, on one hand, and Iran on the other hand consolidate the support for the Sunni Islamic State among many Sunni communities in the world and especially in the Middle East. No doubt that Saudi Arabia and Turkey will find a way to poore money and support to ISIS as the spearhead of the war against Shiites. B. There is no decline in the number of Sunni volunteers joining ISIS, including from Europe. Salafist groups who dream the renewal of the Caliphate are emerging in large numbers all over the Sunni world including in Europe. So there is no retreat in the ideology but on the contrary. C. Europe is in deep anxiety from Islamisation and social instability in general and from Islamic terror more specifically . D. ISIS is still controlling large parts of Sinai Peninsula ( about 25,000 sk”m) and in the recent days The Islamic State’s so-called “province” in Libya has launched, on 01/03/2016, a new offensive and claims to have captured a town on the Mediterranean coast. ISIS is now controlling over 200 k”m from Sirte to Bin Jawad, just in the middle between Benghazi in the East and Tripoli in the West cutting Libya to two. Separately, the jihadists set fire to a storage tank at an oil facility in Ras Lanuf, another port that houses an oil refinery. 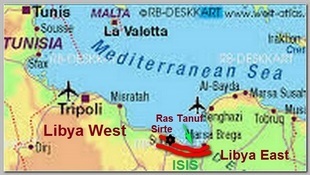 Libya’s rival factions have long fought over access to Ras Lanuf. Indeed Fires caused by clashes between Islamic State (ISIS) militants and guards near Libya’s biggest oil ports have spread to four oil storage tanks that were still burning on Wednesday 01/06/2016, a guards spokesman said. ** At least 47 people have been killed, on Thursday 01/07/2016, after a truck bomb driven by a suicide bomber, targeted a police training centre in the western Libyan city of Zliten, 150 k”m South-East to Tripoli, reports said. ** Tripoli lawmakers, backed by Libyan Islamists, have sacked, on 01/30/2016, Omar al-Hassi, the prime minister of Libya’s rival internationally-recognized government backed by Western powers in Tobruk. The Libyan situation is back on square one despite western hopes. So despite some minor gains in Iraq there is nothing to suggest that ISIS is in retreat – the contrary – it is on the rise.